Preheat oven to 400 degrees F. Place butternut squash chunks on a large baking sheet. Drizzle oil over the squash and toss. Sprinkle with kosher salt and pepper. Roast for 20-30 minutes or until tender, turning once. While the butternut squash is roasting, cook macaroni according to package directions, drain well. Set aside. Add butternut squash to food processor or blender and puree until smooth. Add in 1/2 cup of the milk and puree again. This will help thin out the butternut squash. In a large skillet over medium heat, add the butter. When the butter is melted whisk in the flour. Add the nutmeg and mustard, Cook for 2 - 3 minutes, whisking constantly, or until flour mixture smells nutty. Gradually add the remaining 2 cups of milk and whisk until mixture is smooth. Turn heat to high and bring to a boil while continuing to whisk. After sauce has thickened, turn heat to low and whisk in butternut squash mixture. Add the cooked macaroni to the pan and stir until the macaroni noodles are well coated. Season with salt and pepper, to taste. Grease a 2 quart casserole dish. Pour half of the macaroni noodles into the pan. 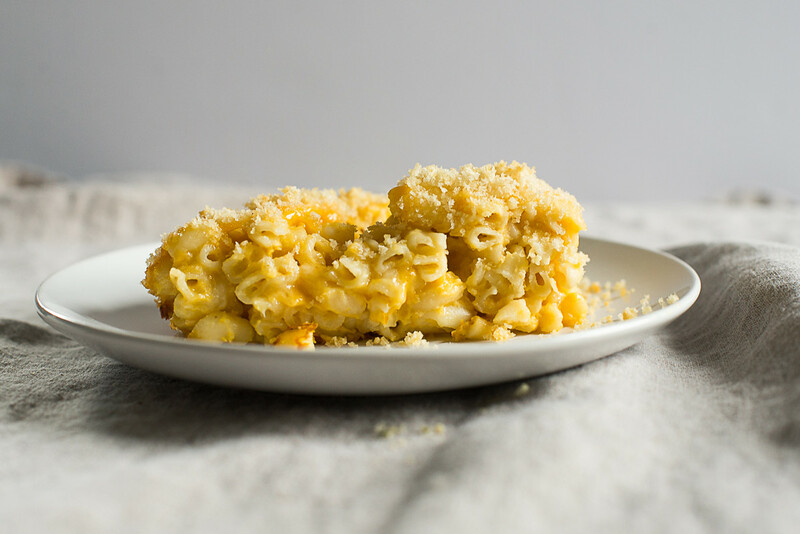 Sprinkle half of the aged cheddar and sharp cheddar over the macaroni noodles. Add the remaining noodles and then top with the rest of the cheese. Mix parmesan and breadcrumbs together with a drizzle of olive oil and sprinkle on top of the casserole. Place the pan in the oven and bake for 25-30 minutes, or until macaroni and cheese is bubbling. Remove from oven and let rest for 5 minutes. Serve warm. Noodles are a great food for new finger food eaters. Consider cutting the elbows more fine at first and cooking a little longer than usual to keep the noodles soft and easy to chew. Consider throwing in some finely chopped baby spinach and cooking into the noodles for extra color and nutrition!